description: Double sided porcelain neon sign in the shape of a fish. Each face of the sign is brightly decorated with many colors in the porcelain. 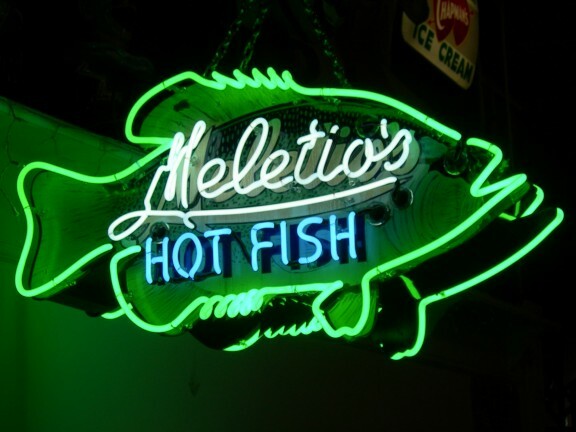 The neon on the sign is very intricate, with many twist, turns and bends, to form the fish shape as well as the wording: "Meletio's Hot Fish." information: The Haven Tavern was established by Ed and Dot Beck in 1940. It quickly became a neighborhood favorite because of the delicious fried fish and ice cold beverages they sold at reasonable prices. Meletio's was the wholesale seafood supplier to the Haven. The Haven is located at 6625 Morganford Road, Saint Louis, Missouri. The Haven also had its own social club: The Haven Club of Missouri; a benevolent organization open to married men of the neighborhood. Monthly meetings were held in the basement of the Haven on the first Monday night of the month. The Club was known for the "food baskets" they would assemble and distribute to the less fortunate.